If I try to study and open a textbook , it makes me crazy. I don’t want to sleep, study, go out, even eat. So when I fell down this kind of condition, I always open 2 phote albums. 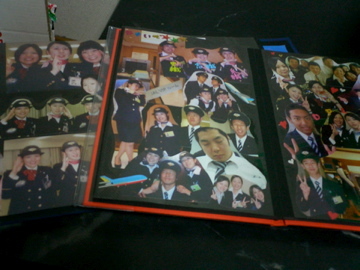 These are the presents from my friends who worked at the airport with me. They gave me this when I quit the job. As you know, I worked at the airport for 3 years,so I got a lot of good friends. They are crazy but awesome!! Especially, I have 5 best friends from the company. They always cheer me up,even if there is a long distance between us. We share happiness and sadness. If I share the good thing with them,it become double happiness. If I share the sad thing with them,it become half. So when I open the albums, I remember about all of them. And I can get power to move.